In case you haven't noticed, I've got a bit of an obsession with memory. I really want to know how far we can push this little noggin of ours. And it never ceases to amaze me how much we can do with an ordinary memory if we're prepared to put in the hours of practice. The trouble is, of course, practice is not something most of us enjoy. So whenever I come across a memory activity or game that I think works really well, and is fun, I add it to this page. Some of these games are stand alone programs, while others are parts of a more comprehensive memory system. Some are commercial products, and some are free. My main criteria are whether they work and whether they're fun to use. After all, a memory game that is fun to play, but ineffective, is a waste of time. And a memory game that's effective, but no fun, will fail through lack of use. This activity seemed a bit strange to me at first. 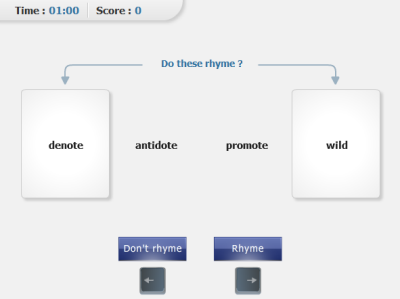 Why is it asking me to decide whether a pair of words rhyme? What does that have to do with memory? As you practice it, you start to see the point. As words begin to disappear, you can't look at them to decide if they rhyme, you have to remember whether they rhyme. This is a great activity for remembering lists of words. You get to decide what type of words you want to memorize (e.g. 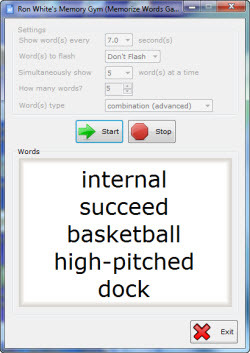 nouns, adjectives, mixed, and so on), how many words you want in each list, and a few other display parameters, and the system tests you in flashcard style. 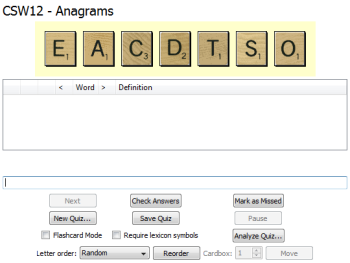 This word memory game is aficionados of anagram games like Scrabble, Words With Friends, and Text Twist. Unlike the last memory activity in which you are faced with a list of words, this time you are faced with a list of jumbled letters! This makes sense when you think about it, because that's exactly what you'll be presented with in a real game. Your job is to memorize which sets of letters form which words. In the screenshot above, I've opted to be tested on a list of high-probability seven letter Scrabble words.